One of the main purposes of using computer is to storage and sharing of data through various means, such as internet, flash drives, CDs, DVDs, etc. For this reason, it turns out to be absolutely necessary to protect your data and files from losing or any kind of damage. There can be various cases that can cause loss of data, such as hard drive crash, spyware/virus/malware attack, etc. Therefore, you need to create a backup of your files and data on a regular basis. In fact, it would be better if you make it your habit. Through this article, we will let you know how to backup your data on Windows 7 computer. Well, first of all you will have to figure out and segregate your important files and folders. Usually, people save their important files and folder in their My Documents or Documents folder, which is found on the desktop. However, sometimes people save or put their data in other section of their hard drive, such as Drive E, F, etc. For this reason, it is better to take a close look into each drive. Before you begin the process of data backup make sure all programs have been closed, particularly the ones that contain data you wish to save or backup. After that, you need to follow the steps mentioned below to backup your data on Windows 7 computer using its inbuilt backup utility. First of all, click the Start button and choose Control Panel and then choose “Back up your Computer” option under the “System and Security” tab. Step 1. Once you click the “Back up your Computer”, the wizard will guide you through the entire process. You may need to have administrator permission or password to do this. For this reason, before you begin the backup process, make sure you have the password, unless you are not the administrator. It would be better if you use a pen drive or USB flash drive to create a backup. Nevertheless, make sure the USB drive is in good condition and free from any virus/spyware/malware. Step 2. In the second step, you need to choose the files and folders you wish to backup. Though you can allow the Windows wizard to select which files and folders for the backup process, but it would be better if you do it by yourself. Step 3. The third step is about scheduling regular backups. 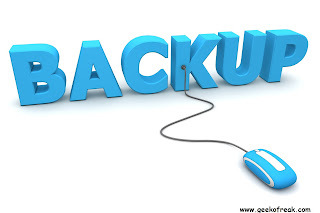 You can select to schedule backups on regular basis, and it is highly recommended that you do it. If not daily, you can also go for Weekly or Monthly options. Step 4. Now, Windows will build up the backup and start the final process, which may time some time if you are doing it for the first time. During this stage, the screen will display the present backup in progress. Once it is done, you can take sigh of relief because now you important files and folders are completely safe. Solutions To Fix Computer Slowdowns And Hangs. how is this different from just copy pasting important files to your flash drive ? Nothing much, but its a way too, and also you can backup all files and folders at once, and you wont miss anything too and then restore as it is, you wont have to organize your files and folders either. * The average computer users blinks 7 times a minute, less than half the normal rate of 20.